MSDE Recruitment 2019: Ministry of Skill Development And Entrepreneurship / www.msde.gov.in is conducting recruitment processes to fill new vacant positions. As of now, there is one recruitment drive going on for Consultants Posts. MSDE Recruitment 2019 - Job notification for Consultants Posts in MSDE, New Delhi on Contract Basis. Applications are invited by Ministry of Skill Development And Entrepreneurship on or before 03 May 2019. 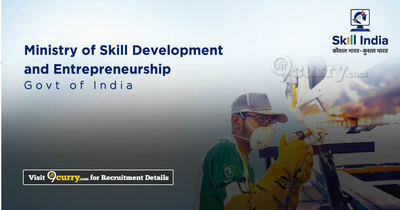 Ministry of Skill Development And Entrepreneurship Recruitment 2019 - Job notification for Young Professional Posts in Ministry of Skill Development And Entrepreneurship, New Delhi on Contract Basis. Applications are invited by Ministry of Skill Development And Entrepreneurship on or before 22 Mar 2019 till 05:30 PM for 2 vacancies. ASDM Recruitment 2018 - Walk in for Project Assistant & DPMT Posts in ASDM, Guwahati, Assam on Contract Basis. Candidates are invited by Assam Skill Development Mission (ASDM) to attend walk-in-interview to be held on 20 Dec 2018 at 10:00 AM for 9 vacancies. PBSSD Recruitment 2018 - Apply Online for 27 Sub-DPM, DPM & Other Posts in PBSSD, West Bengal on Contract Basis. Online Applications are invited by Paschim Banga Society for Skill Development (Utkarsh Bangla) from 09 Oct 2018 to 30 Oct 2018 05:00 PM for 27 vacancies. MPSSDEGB Recruitment 2018 - Job notification for 77 District Facilitator & Manager Posts in MPSSDEGB, Madhya Pradesh on Contract Basis. Applications are invited by Madhya Pradesh State Skill Development & Employment Generation Board on or before 31 Oct 2018 for 77 vacancies. ASAP Kerala Recruitment 2018 - Job notification for Programme Manager Posts in ASAP Kerala, Thiruvananthapuram. Applications are invited by Additional Skill Acquisition Programme - ASAP Kerala on or before 10 Sep 2018 05:00 PM for 8 vacancies. ASAP Kerala Recruitment 2018 - Job notification for Content Developer Post in ASAP Kerala, Kerala on Contract Basis. Applications are invited by Additional Skill Acquisition Programme - ASAP Kerala on or before 16 Jun 2018 for 1 vacancy. KASE Recruitment 2018 - Job notification for Administrative Officer Post in KSID, Keralaon Contract Basis. Applications are invited by Kerala Academy for Skills Excellence (KASE) on or before 08 Jun 2018 til 05:00 PM for 1 vacancy. NSDA Recruitment 2018 - Job notification for Consultant Posts in NSDA, New Delhi. Applications are invited by National Skill Development Agency (NSDA) on or before 09 May 2018 for 2 vacancies. PSDM Recruitment 2018 - Job notification for 31 Project Consultant (Finance) TSA, Block Mission Manager, Block Thematic Expert (Social Mobilization), Block Thematic Expert (Training & Placement), Associate Project Consultant Posts in PSDM, Chandigarh, Punjab on Contract Basis. Applications are invited by PSDM on or before 23 Apr 2018 for 31 vacancies.